It is summer time and time for the National Railway Historical Society's annual convention. In 2016, the convention was to be held in Denver, CO. At the first of this year when we were talking about attending, July seemed a way off in the future. But today is the first of July and the start of our great Rockies Adventure. Chris Guenzler and I decided on a road trip before arriving in Denver for the convention. We would use his car and spend about 18 days traveling around Colorado, parts of Wyoming, Nebraska, and South Dakota. The plan was to see and ride as many tourist railroads and take pics of all steam locomotives in that area. For this trip I am using my new camera for the first time. I bought a Canon EOS Rebel T5 DSLR. My little Canon PowerShot A580 was just worn out. Chris arrived at my home and we left around 9:30 AM. Taking local freeways, we were able to hook up with the I-15 heading north to Barstow. Driving across the Mojave Desert. In Barstow, we took I-40 heading east toward Needles, CA and the Arizona state line. Part of the way we took old Rt 66 where we could, so as to be close to the BNSF main line and watch for trains. We passed Daggett, Ludlow, Klondike and Bagdad and around lunch time we were in Needles and stopping to refuel both the car and us. At 1:00PM there was a line at Carl's Jr. I am not surprised because it is the start of the Fourth of July weekend. After a stop here and at the Chevron station we were on our way and crossing the Colorado River. Colorado River at the California and Arizona state line. On the way to Kingman, AZ. After about a hour after leaving Needles we were nearing Kingman, AZ and our next stop. Kingman, the county seat of Mohave County, is located between Las Vegas and the Grand Canyon and was established in the early 1880's with the arrival of the railroad. It also serves as the transportation corridor to the Grand Canyon National Park, South Rim. Kingman's popularity is maintained as the main stop on the longest existing stretch of Historic Route 66 - the first completely paved national highways in the country. Linking hundreds of towns and cities between Chicago and Los Angeles, Route 66 formed the main street of towns along its route, thus its nickname " Main Street of America." Today travelers can traverse some 158 miles of historic roadway beginning west of Ashfork, continuing through Seligman, Peach Springs, Valentine, Truxton, Hackberry and on to Kingman and through Oatman to Topock. At the junction of I-40 and US 93, Kingman is an access point to lakes Mead, Mohave and Havasu. Ghost towns surround this former gold-mining community. Towns such as Oatman and Chloride were business and social centers for surrounding mining camps during the early 20th century. With many of their original buildings still standing, Oatman and Chloride draw both filmmakers and tourists. In Oatman, visitors may even hand-feed the burros-descendants of those left behind by early-day miners-that roam the town's streets. From Kingman, Oatman is reached by SR 66 (Old Route 66). Chloride is north of Kingman on SR 93 at mile marker 53, 4 miles off the highway on CR 125. 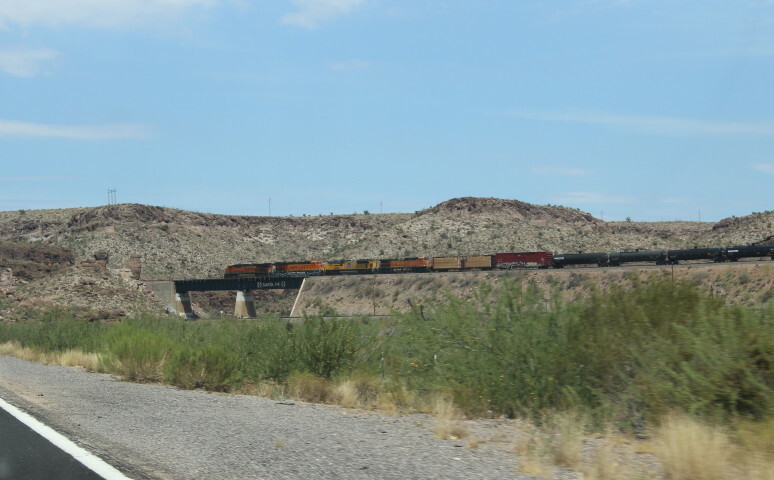 Upon leaving Kingman, we took I-40 east to AZ exit 51 then AZ 66 east looking for trains. This is old US 66. We pass by the hamlets of Hackberry, Valentine, Peach Springs and Nelson. Looking East on old Rt. 66 between Peach Springs and Seligman. Great cloud formations in AZ. We re-enter I-40 east of Seligman at exit 139 and drove to our next stop, Ash Fork. We took exit 146, turn north, right on 1st St, left on Railroad St, right on Double A Ranch Road, then kept left north and west to BNSF mainline. Click here for GPS map. Click back button on your browser to return to this page. Although our stay was brief we saw a good show courtesy of BNSF Railroad. Retracing our steps back to I-40, we arrived at the village of Ash Fork. Back on I-40 we headed east bound for Williams. Taking the Williams exit, we head for the Williams Santa Fe Station and the Grand Canyon SP&S 2-8-2 539 on display. The Amtrak station is located in Williams Junction, AZ which is three miles away from this station. Shuttle service provided by Grand Canyon Railway. Williams was named after William (Bill) Shirley Williams, the early mountain man who guided trapping parties and expeditions through the wilderness. Primarily a resort town, Williams marks the beginning of the major entrance route to Grand Canyon National Park. The town is at the base of Bill Williams Mountain and boasts an 18-hole golf course and a ski area offering both downhill and cross-country skiing. In the surrounding Kaibab National Forest cross-country skiing and hiking are popular. Spokane, Portland and Seattle 2-8-2 539. Used to be on display in Battle Ground, WA. Grand Canyon Railway, .5mi s. of I-40 exit 163, offers round-trip excursions through grassy plains and pine forests to the South Rim of the Grand Canyon aboard 1950's-era passenger cars powered by vintage diesel locomotives. Strolling musicians, Western characters and mock train robbery provide entertainment during the ride. Passengers arrive at the 1910 Grand Canyon Depot, in the historic district at the South Rim; the depot is the only working log depot in the country. Grand Canyon Railway passenger cars. Leaving Williams, we again head east on I-40 to our last stop for the day, Flagstaff. In Flagstaff we take exit 195 -AZ 89 then north on US 180 to the Arizona Historical Society Pioneer Museum which has Southwest Forest 2-6-6-2 12 on display. The museum is in a former hospital for the indigent built in 1908 and contains interpretive historical exhibits about livestock, medicine, domestic life and the lumbering industry in northern Arizona. A 1908 homesteader's cabin, a 1929 Baldwin articulated locomotive and a 1940's Santa Fe caboose are on the premises. Next we went back to the center of town to the Flagstaff Railroad Depot on SR 66 between S. San Francisco and S. Beaver streets, opened in 1926. Flagstaff rests on the Colorado Plateau under the gaze of the San Francesco Peaks amid ponderosa pine forests, high deserts and lakes. Dusted with snow in winter and wildflowers in summer, the mountains provide a scenic backdrop for what was once a mere rest stop. The town was established in 1881. The name Flagstaff is believed to refer to a ponderosa pine tree that was stripped of its branches and used as a flagstaff by members of an exploration party during Fourth of July celebrations in 1876. The flagstaff, visible from afar, remained in place to serve as a landmark for wagon trains bound for California; transients knew that they would find a good place to camp when they spotted it. Shepherd Thomas F. McMillan, said to be the town's first permanent resident, deemed the lane perfect for raising sheep when he arrived in 1876. Early industry revolved around timber, sheep and cattle, but when the Atlantic and Pacific Railway Co. (now the Santa Fe) decided to merge with the Southern Pacific line, settlers again put out their welcome mats, providing water and supplies to the railroad crews. The railroad reached Flagstaff in 1882. The Flagstaff Railroad Depot opened in 1926. Impressive with its Revival Tudor style, it now houses the Flagstaff Visitors Center and an Amtrak station. Downtown Flagstaff, which grew up around the railroad depot, contains many historic buildings dating from the late 1800's to early 1900's. In the 1920's, Route 66 brought travelers through town; they stayed briefly yet contributed to the economy. Money from tourism helped Flagstaff become an incorporated city in 1928, and the route continues to attract visitors. Across the street from the Amtrak station is the Santa Fe freight house with a Southwest Forest Industry 2-8-0 25 on display. Leaving the center of Flagstaff and the robust Friday nightlife, we made our way to the motel to rest after a long first day.